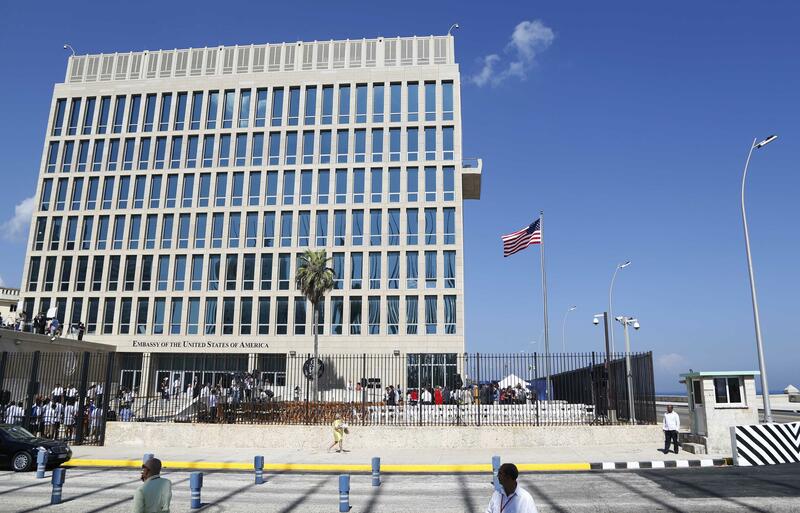 NEW YORK – The Trump administration is considering closing down the recently reopened U.S. Embassy in Havana following a string of unexplained incidents harming the health of American diplomats in Cuba, Secretary of State Rex Tillerson said Sunday. Tillerson’s comments were the strongest indication to date that the United States might mount a major diplomatic response, potentially jeopardizing the historic restart of relations between the U.S. and Cuba. The two former foes reopened embassies in Washington and Havana in 2015 after a half-century of estrangement. Of the 21 medically confirmed U.S. victims – diplomats and their families – some have permanent hearing loss or concussions, while others suffered nausea, headaches and ear-ringing. Some are struggling with concentration or common word recall, the Associated Press has reported. Some victims felt vibrations or heard loud sounds mysteriously audible in only parts of rooms, leading investigators to consider a potential “sonic attack.” Others heard nothing but later developed symptoms. Tillerson once called the events “health attacks,” but the State Department has since used the term “incidents” while emphasizing the U.S. still doesn’t know what has occurred. Cuba has denied any involvement or responsibility but stressed it’s eager to help the U.S. resolve the matter. The last reported incident was on Aug. 21, according to a U.S. official briefed on the matter. The official wasn’t authorized to discuss the matter publicly and requested anonymity. A decision to shutter the embassy, even temporarily, would deal a demoralizing blow to the delicate detente that President Barack Obama and Cuban leader Raul Castro announced in late 2014. The next year, embassies were reopened and restrictions on travel and commerce eased – signs of a warming relationship that displeased some hard-liners in Cuba’s government. President Donald Trump has reversed some of the changes, but left many in place. Tillerson spoke on CBS’ “Face the Nation” as world leaders and top diplomats descended on New York for annual U.N. General Assembly meetings. President Donald Trump will give his first speech on the major global platform this week. Cuba is also represented at the U.N., but it’s not expected Trump will meet with any Cuban leaders or officials during his visit. The U.S. hasn’t identified either a culprit or a device. Investigators have explored the possibility of sonic waves, an electromagnetic weapon, or an advanced spying operation gone awry, U.S. officials briefed on the probe told the AP. The U.S. hasn’t ruled out that a third country or a rogue faction of Cuba’s security services might be involved. “Cuba’s neglect of its duty to protect our diplomats and their families cannot go unchallenged,” said the lawmakers, who included Sen. Tom Cotton of Arkansas, who led the effort, and Sen. Marco Rubio of Florida, a prominent Cuban-American and critic of the U.S. detente. The incidents have frightened Havana’s tight-knit diplomatic community, raising concerns about the potential scope. At least one other country, France, has tested embassy staff for potential sonic-induced injuries, the AP has reported. Published: Sept. 17, 2017, 11:02 a.m. Tags: closing, cuba, embassy, Rex Tillerson, U.S.